A few weeks ago, Next gave myself and 5 other bloggers the challenge to style the same jersey bomber jacket, each in our own way. Now I was a bit nervous of the bomber jacket look. It's right up there with skate shoes, i.e. I need to see more 40+ girls rocking the look before I am convinced there's a gap in my wardrobe but the challenged was put to me so I accepted! Here what I went for.. So...what about the bomber. Well, I'm loving the the fact that it's so comfortable, you can wear it like a cardigan or a sweatshirt all day indoors and out. I'm also liking that it's casual but not denim so it works with all my jeans...this guarantees it will get lots of wear. That and the fact that it's grey! I would say the size 12 I got is a little on the big side for me but I am conscious that it may get smaller with washing and it's only the arms that feel too big so pushing them up works a treat. 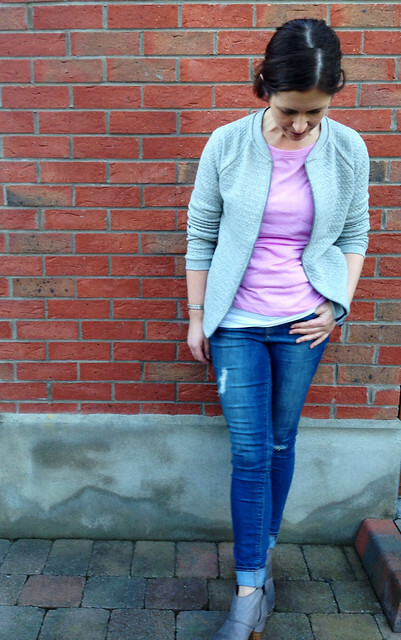 And here's a more casual look from the day before with distressed jeans from Gap, my grey Clarks ankle boots and a jersey top from Heatons in one of my most favourite shades of pink/purple. 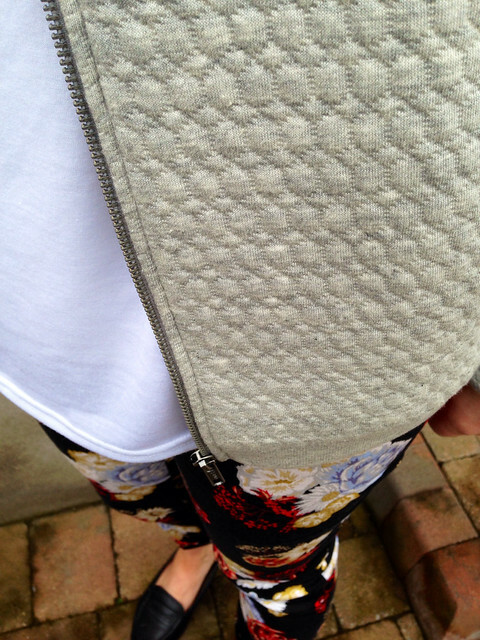 Thanks to Next for providing this bomber jacket free of charge for the purpose of this review. It's so interesting to see the same jacket styled in so many different ways. Like you I've steered clear of the bomber jacket - to be honest, I'm not sure that the style of the collar suits me. 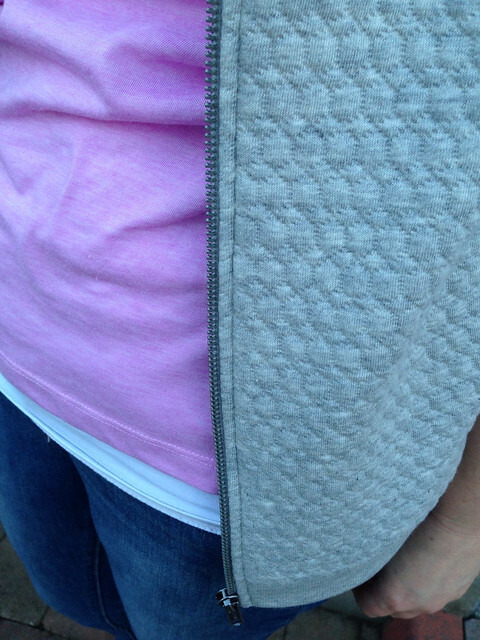 But I love the way you've all styled it and it is definitely a great alternative to a cardi or sweater. Love the grey shade! I love both your looks Avril. I wore the 10 and I would say it's a good healthy generous size 10 and hope that (like yours) it will reduce only ever so slightly once washed. The colours of the pink t and the layering tshirt with the jeans and boots is gorgeous. Isn't it great to see it styled SO differently on such different body shapes. I will be wearing this A LOT! Reminds me of the grey one from last season that I had, lovely on you avril. Ordered a red myself, I hope I like! Love how you've teamed it with the printed trousers Avril, it looks fab & it's great to see everyone's different interpretations too. You've hit the nail on the head - it will be so comfy to wear as a cardigan or a jacket and that's really important if something is going to work for you. I was just saying on Frances' post that I actually have a similar one from last year as well so I dug it out today after seeing all of your posts. What's nice about this is that it has shades of the bomber without going full on with the look which might scare some people but because there are no contrast sleeves and fancy logos on it. Good call on the grey though I did think you might have gone with the red. It's always good to surprise! What a great post and I love all the style options. Not familiar with Next (in Canada) but going to check them out now that I've seen this post...oh and going to check everyone else's post too. 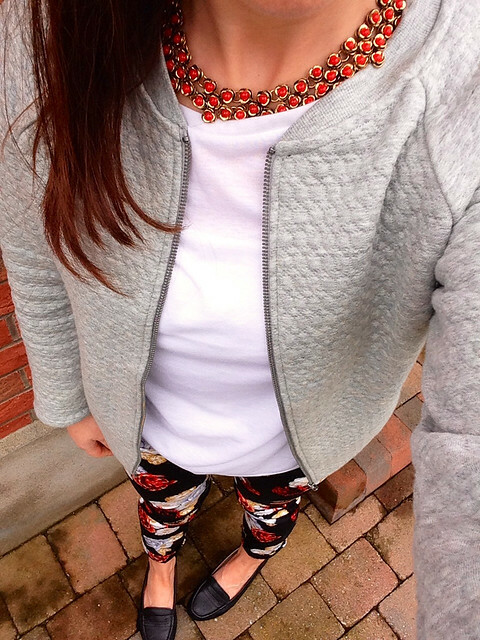 I love this post, so great to see how you've all styled it. Love yours Avril with the floral trousers - it will go with so many things. Like the Gap jeans look. Don't think the jacket does the floral jeans any favours.